Seeking sponsorship for event organization has been a major factor in our entertainment Industry with many complains over lack of funds for the success of events. 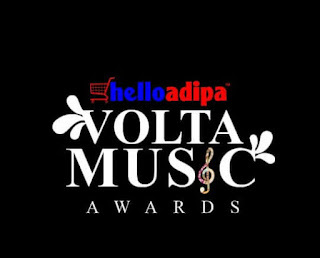 The success of the maiden edition of the Volta Music Awards has seen a sponsorship package from "helloAdipa". 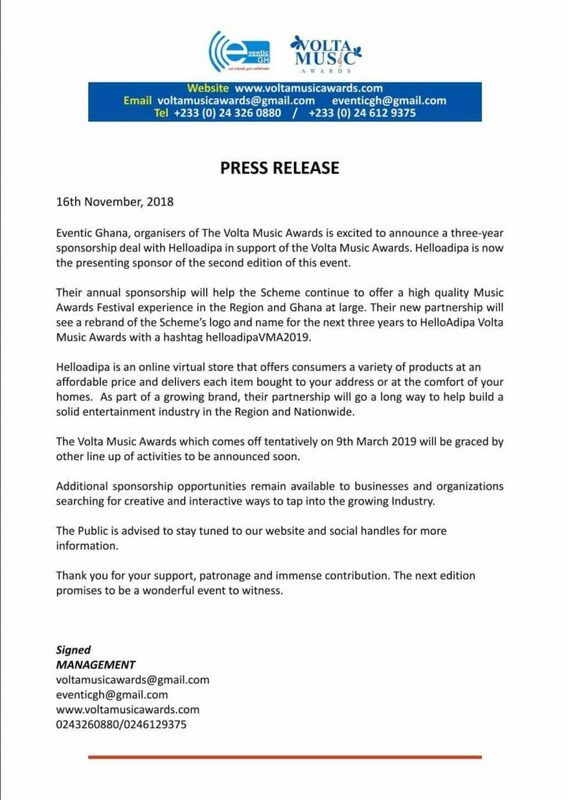 Volta Music Awards organized by Eventic GH is an annual event fashioned to stimulate musicians and creative persons in the region to develop more creative efforts towards improving the quality of local music to meet world standards. 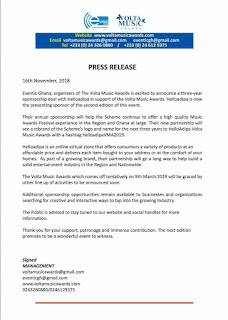 Since its inception over a year ago, the Volta Music Awards has been embraced by all stakeholders in the music industry including music artistes, locally and at the international level. The good news however to the general public is, "helloAdipa" an online shop which enables people to shop nation wide is signing 3 years contract with Eventic GH making them the headline sponsors of Volta Music Awards which will now be changed to "helloAdipa Volta Music Awards". The good news hereby is, the artiste of the year and discovery of the year becomes the brand ambassador of helloAdipa and helloAdipa signs contract with the artist management. Volta Music Awards has since its inception rewarded the hard work of pioneers in the music industry from the region. Organizers however expressed gratitude to helloAdipa for accepting their offer and also appealing to corporate bodies to help in sponsoring subsequent editions to make it a unique event.